BALI – “The Islands of the Gods” is a paradise loved by people worldwide, blessed by a wonderful culture dedicated to arts & spirituality, abundant natural treasures of mountain jungles and rivers, stunning beaches, fertile volcanic soils, and once abundant fresh water. Water in Bali is not only a natural resource. 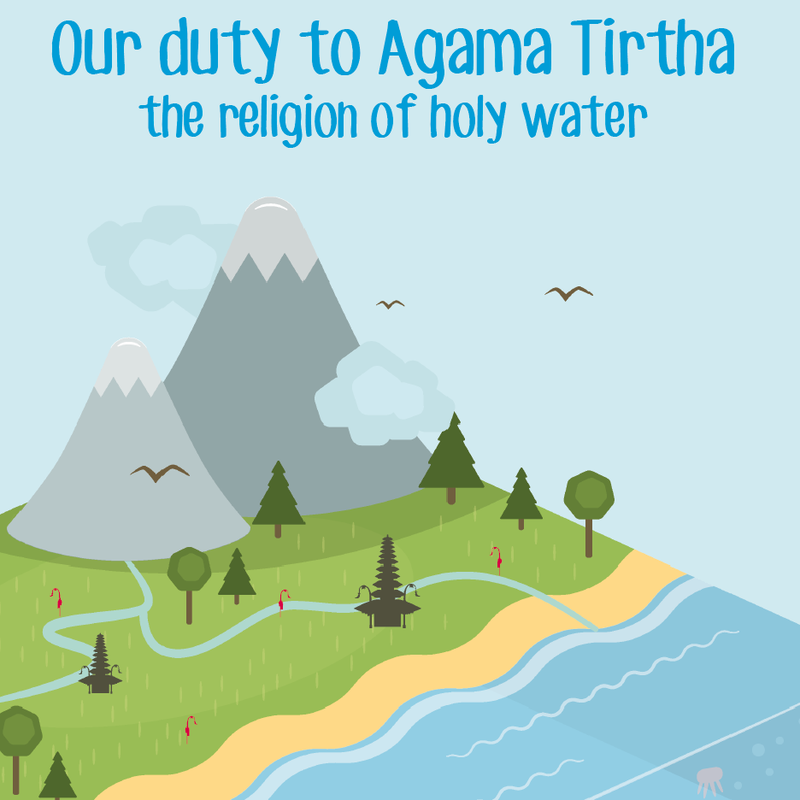 It is the core of the Hinduism as the Balinese call their flavor of the Hindu religion Agama Tirtha: “The Religion of the Holy Water.” As they believe that water has strong powers such as healing. Nowadays, our paradise is sadly under threat. The immense development boom of the last 20+ years – that now caters to over 10.16 Million+ foreign & domestic tourists – has resulted in a dramatic water crisis that is not being addressed at the moment. Ironically, if more than 60% of the freshwater is used by the tourism industry, its actors do very little about it and protect their own livelihood. Indeed, no tourism is possible without water. Still, Bali’s watersheds are drying at an alarming rate, mostly due to over-extraction. Yet, Bali is one of the few islands in the world blessed by heavy rainfall and theoretically receives enough water from the rainy season to fulfill its present and future needs. Thus, rainwater only needs to be harvested to balance its consumption, and sustain an annual growth in millions of tourists visiting the popular holiday island. At the moment, the decrease of its water tables levels as well as saltwater intrusion into freshwater aquifers due to excessive extraction of water. Freshwater aquifers are now contaminated by saltwater caused by an imbalance of excessive withdrawal of freshwater compared to natural rate of replenishment. A more visible issue is the freshwater pollution due the illegal trash disposal and excessive use of chemical for agriculture farming. We heavily rely on filtered water to…live! Despite all the threats to Bali’s freshwater, we are thrilled to know how to impulse positive change and save Bali’s holy water! The Bali Water Protection Program (BWP) proposes to impulse freshwater resilience and good practice throughout the province through 3 subprograms. * “Adopt A well”: it will be a network of recharge wells harvesting storm water to both have increased available freshwater supply and stop coastal salt water intrusion. Similar to home rainwater collection, the wells aim to refill the aquifer, that “giant lake” under our feet. In association with the university Polytechnic Negeri Bali, IDEP will build (and/or rehabilitate) a total of 136 rainwater-fed gravity open wells and filters which are to serve as rapid freshwater replenishment areas in 13 critical areas of the province. In other words, we will repair the damages that we have done in the past! * “Adopt A River”: the next generation is the key to protect Bali’s rivers. Kids of today will be the actors of tomorrow’s island water quality. Thus, this subprogram is taking the shape of an educational program to reduce water consumption and sources of pollution in the river that reduces the amount of water available for consumption. With this subprogram, we will invite 9-12 years old children living along 11 to become ‘river ambassadors’. We aim them to “own” their rivers and to wish for their protection by adopting better behaviors. Ultimately, we hope that they will teach around them how littering the trash in the rivers impact the water quality Like real ambassadors! To do so, IDEP will be providing 2 sessions of water education over 2 days in a total of 132 schools. IDEP will donate to each school of 10 bi-lingual comics about water and books about general ecology. * “Adopt Water”: one of the biggest issues about water crisis in Bali is its ignorance by everyone living in Bali, be it foreigner or local. It is surprising to know how many people do not know that Bali is experiencing a dramatic situation with its water supply. To overcome this, communication and awareness are absolutely critical. Thus, IDEP will conduct a large scale media campaign to raise awareness about the water issue and favour sustainable behaviors from both population and businesses. This 1 year media campaign will involve the use of all Medias at our disposal including monthly articles about water-related issues in local provincial newspapers, one 30-minutes TV Talk Show per month with the broadcasting of a short Public Service Announcement film and large water information banners displayed intermittently at high-traffic points in the province. As highlighted by Ade Andreawan, IDEP’s Executive Director, “what the project is trying to show and implement is that there is a solution to this critical crisis, that it is not a fatality”. We all use water at different levels so to protect this wonderful natural resource is everyone’s responsibility. Bali still is a wonderful paradise and IDEP’s Bali Water Protection program is the biggest environmental project available to make a positive change in this island who generously hosts us. This is our chance to show respect to Agama Tirtha and to the gods of Bali.